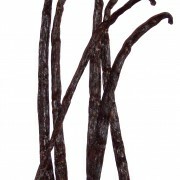 Vanilla is second only to saffron as the costliest spice. This is due to the labor intensity of growing and pollinating these plants. What is used in cooking is the long thin brown seed pod and the thousands of little black seeds the pod contains. There are only a few growers of vanilla in Hawaii, each growing the Tahitian variety of vanilla, whose pods are thinner than other varieties but contain more oil and are fruity in fragrance. – Pods are usually split lengthwise to expose the little seeds. Tip of the knife is used to scrape the seeds out for use in recipes. – Fresh vanilla seeds seeds are most often to flavor ice cream, sweet sauces and desserts. – Pods are used most often to infuse sugars, liquors and distillates. Pods should be plump and oily in appearance. The fragrance should be apparent and heady. Avoid pods that are dried. Store pods in air tight container away from light and heat. Wrapping pods well in plastic wrap then freezing also helps to contain the oils for longer term storage.